Truckers across the U.S. are likely already starting to face some of the most common issues when it comes to winter driving hazards. Icy roads, blasting winds, snowy conditions and big traffic delays all become quite common at this time of year, so it's important to brush up on the best practices for operating a big rig when winter arrives. Whenever truckers are getting ready to hit the road in winter, they should always know what they're getting into, according to Schneider. While it might not be snowing now, conditions 100 miles down the highway could be quite different, and it's important not to drive into any adverse situations unawares. This weather is usually unavoidable, but drivers need to make sure they're doing all they can to understand the situation in advance. Another thing to do before heading out is to make sure everything on the truck is in good shape, from the headlights and tires to clearing ice off the roof of the trailer (when possible) and making sure all liquids are topped off, Schneider advised. While this might not always seem necessary, it's better to be safe than sorry. Once truckers are on the road, they have to ensure they're giving fellow motorists plenty of room, according to Roadmasters. 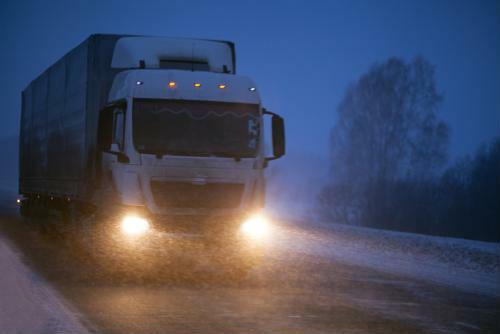 The fact of the matter is that while truckers probably have plenty of experience dealing with adverse conditions, that's not always the case for the people driving in front, alongside or behind them. Because trucks need more space to slow down and stop, giving everyone a wide berth is always a good idea. Along similar lines, it's important for drivers to make sure they're going below the speed limit when snowy and icy conditions appear, Roadmasters further noted. While they may not be likely to crash on their own, an abundance of caution is always better. The same slow approach is also recommended when it comes to accelerating and braking, because slamming on the gas or brakes can lead to unexpected movements if road conditions are poor. When drivers think they might be driving into some tough conditions, there are often signs that presage the actual arrival of those potential hurdles, according to Cardlog. For instance, ice buildup on side mirrors, a line of brake lights ahead or ominous clouds might be a sign that conditions are changing rapidly or soon will. Finally, drivers should make sure they have everything they need in their cabs, Cardlog added. That includes tire chains for particularly snowy roads, de-icer liquid, windshield scrapers, and so on. While most drivers will have these pieces of equipment on hand, it's a good idea to check and make sure they are in good shape throughout the winter. When drivers are more careful about how they proceed throughout the winter, they are far more likely to uphold strong safety records.